The old spirit of Vegas is alive at the Royal Vegas Casino. Players are transported to a time and place where players were kings and queens, where gaming and winning were companions, and loyalty was rewarded. Players definitely receive the royal treatment. They can immerse themselves in all the glamour and excitement of Vegas style gaming from their own home or mobile device. The Royal Vegas Casino was founded in 2000. It is registered on the Mediterranean island nation of Malta. They are part of the Fortune Lounge Casino Group, which is one of the largest online casino groups in the world. The casino features desktop and mobile gaming, generous bonuses, frequent rewards, and large jackpots. The Royal Vegas Casino has an awesome bonus available for new players. New players can get up to 1200 dollars and 120 free spins on their first three casino deposits. It works out like this. They get a 100% deposit bonus and 30 free spins on up to $250 of their first deposit. They get a $200 bonus on a 25% deposit match and 40 free spins for their second deposit. Players get a $750 bonus on a 50% deposit match and 50 free spins for their third deposit. The 120 free spins bonus is a minimum; players who deposit more can get up to 200 free spins. The Royal Vegas Casino provides continuing rewards to loyal players in the form of their rewards program. The program aims to treat players like royalty by providing points for their play. Players collect points based on the game they play and their bet size. Slot machine play gives 1 point for every 1 credit wagered. Other games provide different points for different credits wagered. Once players reach 5000 points, they can redeem their points for credits. The exchange rate is 1000 points gives players 1 credit. As players earn more points, they can move up to higher levels from the Silver Level to the Gold Level then to Platinum Level and finally the Diamond Level. The more a player plays, the more the player earns. The Diamond Level offers bonus 100,000 bonus points for playing on the player’s birthday, an ongoing loyalty bonus every month, and a 15% bonus on points earned. There are many regular casino promotions that regular players can take part in at the Royal Vegas Casino. These promotions include monthly drawings, free holidays, free spins, bonus points, and even a cruise on the Fortune Lounge cruise ship. These rewards keep the playing more exciting. The Malta Gaming Authority licenses the Royal Vegas Casino. Malta is an EU and Eurozone member with a superior legal framework and experience regulating online casinos. Their most recent license number is MGA/CL1/932/2013 issued in November 2014. The Royal Vegas adheres to the eCOGRA Code of Conduct and carries the eCOGRA Seal of Approval. eCOGRA is the largest and most important independent online gaming organization. They are devoted to fair play, online gaming security, and gaming integrity. Players can expect multiple language support. Not only can they play in English but they can play in Spanish, German, Italian, Portuguese, French and Greek. They can understand and enjoy the games without worrying about understanding a different language. Players can expect that the games will be fair. The most important part of any casino is fair play and this is even more important in an online casino. Fair play is backed by Malta Gaming Authority regulations and the eCOGRA Seal of Approval. There are more than 700 games available for players on the download casino software. The software is Microgaming based and is the industry standard for quality, security, and stability. Players can download the software and after logging in and funding their account, they can start playing games and winning. Players can expect a dizzying array of games available on their no download, web and mobile based casino. There are 263 different slot games, 56 different table games, 23 video poker machines, 16 different progressive games, 31 scratch cards, and 18 casual games. As these games are browser based, they can be played in any browser, including browsers on tablets and other mobile devices. Players have a chance to win large progressive jackpots at the Royal Vegas Casino due to its membership in the Fortune Lounge Casino Group. They are one the largest networks of online casinos in the world, and this means that progressive jackpots are some of the highest in online casinos. Nonprogressive games offer impressive payouts as well. This makes playing at the Royal Vegas Casino a profitable experience for all players. The security and privacy at the Royal Vegas Casino is second to none. What happens in the Royal Vegas stays in the Royal Vegas. Player personal information is never sold or transferred to third parties. Transactions receive end to end protection with 128-bit encryption. That’s the same standard encryption used by the world’s financial institutions. They utilize Risk Sentinel to combat fraud and keep accounts secure. The Royal Vegas works only with quality and vetted electronic cash merchants when handling player deposits and player withdrawals. These merchants include Skrill, Entropay, Neteller, Mastercard, and Visa. These partners quickly get players deposits into the casino so they can quickly start playing. Withdrawals are straight forward. Players can choose when to withdraw their winnings. Withdrawals happen quickly and easily with an eye on security of player accounts. While withdrawals remain pending, players can easily access them for playing if they change their mind. Kings and Queens expect exemplary customer service. Players are not disappointed. With dedicated customer service agents prepared to handle any issues, players can focus on playing and winning. They know that if there is an issue, the trained professionals will respond quickly and ensure that their play is unaffected by glitches. 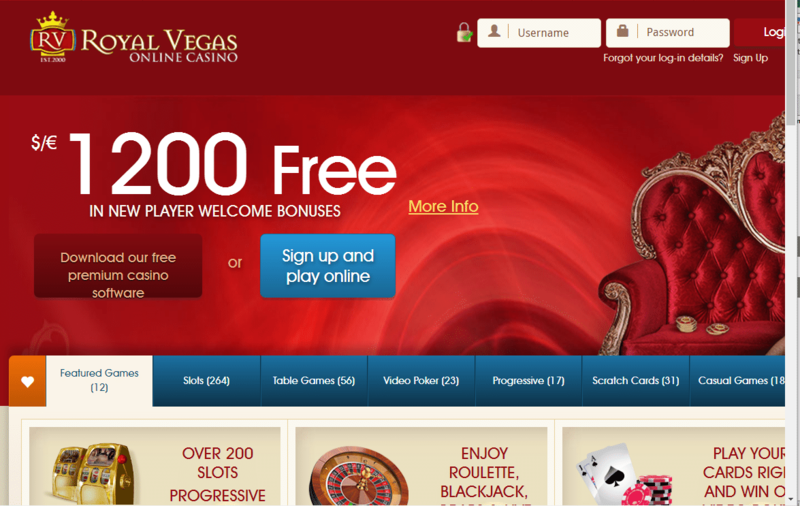 The Royal Vegas Casino is a step forward to a new era of online gaming. Customer service that treats players like royalty, generous bonuses, rewarding loyalty points, and large jackpots all combine to make this casino a must visit. With exciting games and a royal immersive experience, gaming is once again the way it should be.